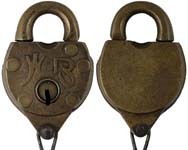 All locks have "Arc Tops" unless otherwise noted. 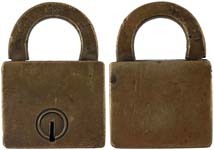 All locks have "Spring Bolts" unless otherwise noted. Height measurements exclude the clevis if present. Depth measurements exclude the dust guard if present. "101". 2 3/8" wide (Actual: 2.198” wide x 3.296” high x .648” deep). Bronze case. Bronze shackle. Flat key. Clevis and chain. Catalog #: 101, first appears in catalog of 1880. Mfg by: Wilson Bohannan Co.
"102" - Seal. 2 3/4" wide. (actual: 2.524" wide x 3.330" high x .818" deep). Bronze case. Bronze shackle. Post key. 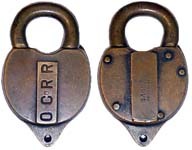 Heavy tumbler lock for RR Cars and Switches. Clevis and chain. Spring dust guard. There is a hole going through the case and the shackle to accept a wire seal. "W BOHANNAN BROOKLYN, N.Y. PAT. 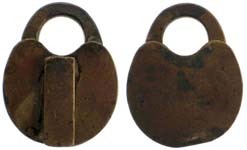 JUNE 25,78 C 102" is stamped on the obverse of the shackle. Catalog #: 102, first appears in catalog of 1880, listed in index only. Mfg by: Wilson Bohannan Co. Wilson Bohannan Patent # 205171. We have not found a non-logo #102 seal as yet. When we do we will post it. "103". 1 1/2" wide (Actual: 1.954" high x 1.498” wide x .412” deep). Bronze case. Bronze shackle. Post key. Catalog #: 103, first appears in catalog of 1880, listed in index only. Mfg by: Wilson Bohannan Co.
"104". 1 3/4" wide (Actual: 2.228" high x 1.744" wide). Bronze case. Bronze shackle. Post key. "W BOHANNAN BROOKLYN N.Y. PAT. 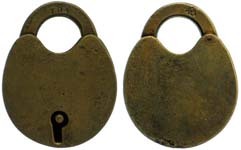 JUNE 25 78" is stamped on the obverse of the shackle. Catalog #: 104, first appears in catalog of 1880, listed in index only. Mfg by: Wilson Bohannan Co. Wilson Bohannan Patent # 205171. "105". 2 1/4" wide (Actual: 2.188" wide x 2.832" high x .602" deep). Bronze case. Bronze shackle. Post key. Catalog #: 105, first appears in catalog of 1880. Mfg by: Wilson Bohannan Co. 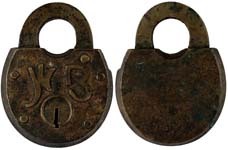 This lock was listed as 2 1/4" wide in catalogs of 1880 and 1886, all other subsequent catalogs listed it as 2 1/8" wide. "106" - 2 1/8. 2 1/8" wide (Actual: 2.177" wide x 2.841” high excluding clevis x .583” deep). Bronze case. Bronze shackle. Post key. Clevis and chain. "Brooklyn NY". Catalog #: 106, first appears in catalog of 1880. Mfg by: Wilson Bohannan Co.
"106" - 2 1/4. 2 1/4" wide (Actual: 2.234" wide x 2.829” high excluding clevis x .610” deep). Bronze case. Bronze shackle. Post key. Clevis and chain. "Marion Ohio". Catalog #: 106, first appears in catalog of 1880. Mfg by: Wilson Bohannan Co.
"107". 2 1/4" wide. (actual: 2.186" wide x 2.743" high x .592" deep). Bronze case. Bronze shackle. Post key. Tumbler. No spring on dust guard. Catalog #: 107, first appears in catalog of 1880, listed in index only. Mfg by: Wilson Bohannan Co.
"108". 2 1/4" wide (Actual: 2.194” wide x 2.743” high x .738” deep). Bronze case. Bronze shackle. Post key. Tumbler. Spring dust guard. Catalog #: 108, first appears in catalog of 1880, listed in index only. Mfg by: Wilson Bohannan Co.
"110". 2 1/4" wide. (actual: 2.191" wide x 2.756" high x .610" deep). Bronze case. Bronze shackle. Post key. Tumbler. Spring dust guard. Clevis and chain. Catalog #: 110, first appears in catalog of 1880, listed in index only. Mfg by: Wilson Bohannan Co.
We have not found a non-logo as yet. "111". 2 1/2" wide. (actual: 2.418" wide x 3.061" high x .592" deep). Bronze case. Bronze shackle. Post key. Tumbler. No dust guard. No clevis and chain. Catalog #: 111, first appears in catalog of 1880, listed in index only. Mfg by: Wilson Bohannan Co.
"112". 2 1/2" wide. (actual: 2.492" wide x 3.075" high x .649" deep). Bronze case. Bronze shackle. Post key. Tumbler. No dust guard. Clevis and chain. Catalog #: 112, first appears in catalog of 1911, listed in index only. Mfg by: Wilson Bohannan Co.
"113" - Regular Shackle. 2 1/8" wide. (actual: 2.302" wide x 2.878" high x .600" deep). Bronze case. Bronze shackle. Post key. Clevis and chain. Spring dust guard. Catalog #: 113, first appears in catalog of 1894. 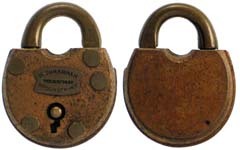 Mfg by: Wilson Bohannan Co.
All of the WB catalogs list this lock as being 2 1/8" wide. 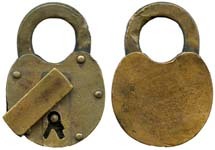 All of the locks that we have examined are 2 1/4" wide. 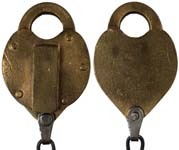 "113" - Regular Shackle - "CLOSE LOCK TO TAKE KEY OUT". 2 1/8" wide (Actual: 2.296" wide x 2.850 x .667" deep). Bronze case. Bronze shackle. Post key. Key retaining. Clevis chain. Spring dust guard. Catalog #: 113, first appears in catalog of 1894. 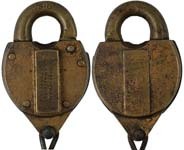 Mfg by: Wilson Bohannan Co.
"113" - Regular Shackle - Double Keyway. 2 1/8" wide (Actual: 2.285" wide x 2.929" high x .650" deep). Bronze case. Bronze shackle. Post key. Clevis and chain. Spring dust guard (spring broken or missing). Catalog #: 113, first appears in catalog of 1894. Mfg by: Wilson Bohannan Co.
"113" - Large Shackle. 2 1/8" wide (Actual: 2.277" wide x 3.261" high x .661" deep). Bronze case. Bronze shackle. Post key. Clevis and chain. Spring dust guard. Notched dust guard. Key post repaired. Catalog #: 113, first appears in catalog of 1894. 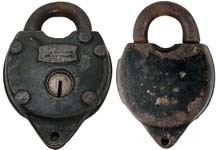 Mfg by: Wilson Bohannan Co.
"113" - Large Shackle - Double Keyway. 2 1/8" wide (Actual: 2.261" wide x 3.210" high x .610" deep). Bronze case. Bronze shackle. Post key. 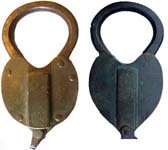 Clevis and chain (clevis and chain removed). Spring dust guard. Catalog #: 113, first appears in catalog of 1894. 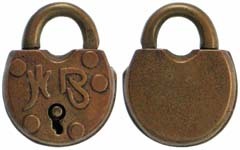 Mfg by: Wilson Bohannan Co.
"115" - Bronze - "WB" - Regular Case Posts - Regular Bronze Shackle - Regular Dust Guard. 2 1/2" wide. (actual: 2.558" wide x 3.222" high x .768" deep). Bronze case. Bronze shackle. Post key. Spring dust guard. Clevis and chain. 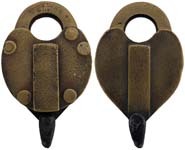 For Railroad cars and switches. "WILSON BOHANNAN BROOKLYN,N.Y. 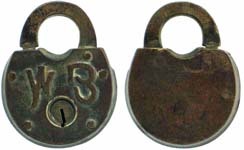 115" is stamped on the obverse of the shackle. Catalog #: 115, first appears in catalog of 1886. 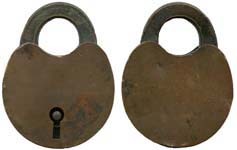 Mfg by: Wilson Bohannan Co.
"115" - Bronze - "WB" - Regular Case Posts - Regular Iron Shackle - Regular Dust Guard. 2 1/2" wide. Bronze case. Iron shackle. Post key. Spring dust guard. Clevis and chain. 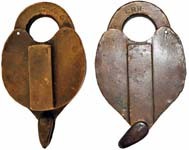 For Railroad cars and switches. Catalog #: 115, first appears in catalog of 1886. 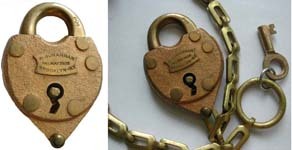 This lock is not listed in any WB catalogs that we have. 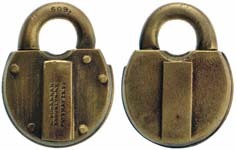 Mfg by: Wilson Bohannan Co.
"115" - Bronze - "WB" - Regular Case Posts - Large Bronze Shackle - Notched Dust Guard. 2 1/2" wide. (actual: 2.519" wide x 3.576" high x .691" deep). Bronze case. Bronze shackle. Post key. Spring dust guard. Clevis and chain. 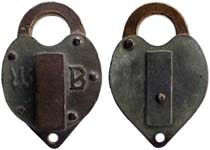 For Railroad cars and switches. "WILSON BOHANNAN MARION OHIO U.S.A. 115" is stamped on the obverse of the shackle. Catalog #: 115, first appears in catalog of 1886. 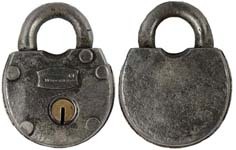 This lock is not listed in any WB catalogs that we have. 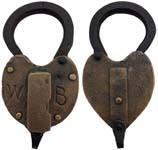 Mfg by: Wilson Bohannan Co.
"115" - Bronze - "WB" - Regular Case Posts - Extra large Iron Shackle - Notched Dust Guard. 2 1/2" wide (Actual: 2.550" wide x 4.323" high x 0.695" deep). Bronze case. Iron shackle. Post key. Spring dust guard. Clevis and chain. For Railroad cars and switches. Catalog #: 115, first appears in catalog of 1886. 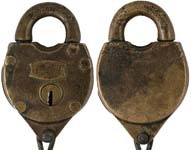 This lock is not listed in any WB catalogs that we have. 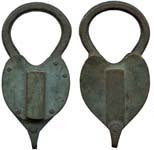 Mfg by: Wilson Bohannan Co.
"115" - Bronze - "WB" - Countersunk Case Posts - Extra large Bronze Shackle - Regular Dust Guard. 2 1/2" wide. Bronze case. Bronze shackle. Post key. Spring dust guard. Clevis and chain. For Railroad cars and switches. Catalog #: 115, first appears in catalog of 1886. 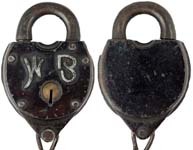 This lock is not listed in any WB catalogs that we have. 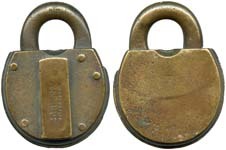 Mfg by: Wilson Bohannan Co.
"115" - Bronze - No "WB" - Reinforced Case Posts - Regular Bronze Shackle - Regular Dust Guard. 2 1/2" wide (actual: 2.534" wide x 3.172" high x 0.806" deep). Bronze case. Bronze shackle. Post key. Spring dust guard. Clevis and chain. For Railroad cars and switches. Catalog #: 115, first appears in catalog of 1886. 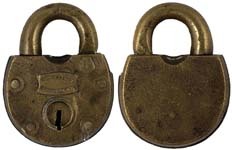 Mfg by: Wilson Bohannan Co.
"115" - Bronze - No "WB" - Regular Case Posts - Large Iron Shackle - Regular Dust Guard. 2 1/2" wide. Bronze case. Bronze shackle. Post key. Spring dust guard. Clevis and chain. For Railroad cars and switches. "WILSON BOHANNAN MARION OHIO U.S.A. 115" is stamped on the obverse of the shackle. Catalog #: 115, first appears in catalog of 1886. 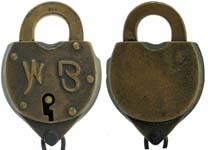 This lock is not listed in any WB catalogs that we have. 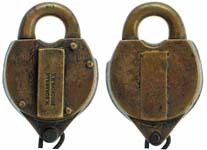 Mfg by: Wilson Bohannan Co.
"115" - Bronze - No "WB" - Regular Case Posts - Extra Large Bronze Shackle - Regular Dust Guard. 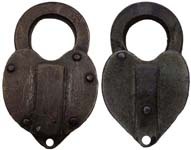 4 3/4" high x 2 1/2" wide x 2 3/4" shackle width. Bronze case. Bronze shackle. Post key. Spring dust guard. Clevis and chain. 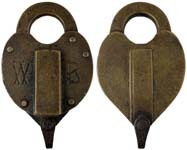 For Railroad cars and switches. 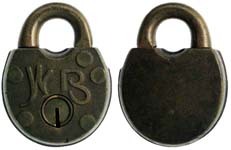 "115" is stamped on the obverse of the shackle. Catalog #: 115, first appears in catalog of 1886. 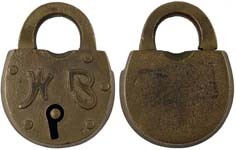 This lock is not listed in any WB catalogs that we have. 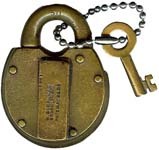 Mfg by: Wilson Bohannan Co.
"115" - Bronze - No "WB" - Regular Case Posts - Extra Large Iron Shackle - Regular Dust Guard. 2 1/2" wide (Actual: 2.537" wide x 4.254" high x .748" deep). Bronze case. Iron shackle. Post key. Spring dust guard. Clevis and chain. 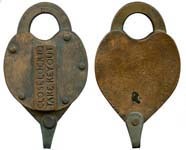 For Railroad cars and switches. 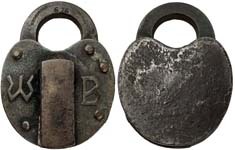 "115" is stamped on the obverse of the shackle. Catalog #: 115, first appears in catalog of 1886. 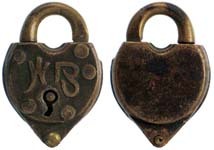 This lock is not listed in any WB catalogs that we have. 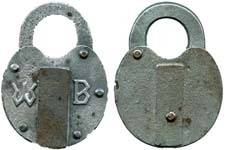 Mfg by: Wilson Bohannan Co.
"115" - Iron - "WB" - Large Shackle - Notched Dust Guard. 2 1/2" wide. (actual: 2.570" wide x 3.588" high x .708" deep). Iron case. Iron shackle. Post key. Spring dust guard. Clevis and chain. 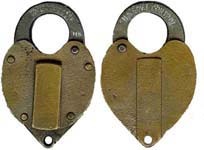 For Railroad cars and switches. "WILSON BOHANNAN MARION OHIO U.S.A." is stamped on the obverse of the shackle. Catalog #: 115, first appears in catalog of 1886. 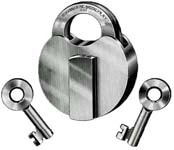 This lock is not listed in any WB catalogs that we have. Mfg by: Wilson Bohannan Co.
"116" - Regular Shackle. 2 1/2" wide (Actual: 2.542” wide x 3.699” high x .981” deep). Iron case. Iron shackle. Post key. Spring dust guard. 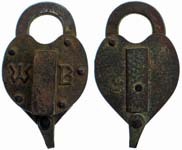 Double tab clevis and chain. For Railroad cars and switches. Catalog #: 116, first appears in catalog of 1886. Mfg by: Wilson Bohannan Co. Wilson Bohannan Patent # 205171. 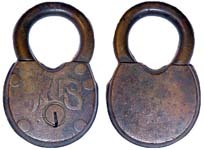 "116" - Large Shackle. 2 1/2" wide (Actual: 2.498” wide x 3.820” high x .974” deep). Iron case. Iron shackle. Post key. Spring dust guard. 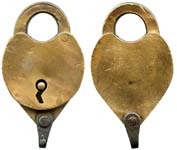 Double tab clevis and chain. For Railroad cars and switches. Catalog #: 116, first appears in catalog of 1922. Mfg by: Wilson Bohannan Co. Wilson Bohannan Patent # 205171. "117" - Regular Case Posts - Notched Dust Guard. 2 1/2" wide. (actual: 2.494" wide x 3.166" high x .769" deep). Bronze case. Bronze shackle. Post key. 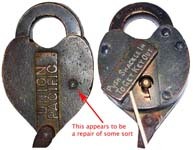 This lock could be ordered with the key retaining mechanism. Spring dust guard. Clevis and chain. Catalog #: 117, first appears in catalog of 1922. Mfg by: Wilson Bohannan Co. The notched dust guard was not found in any of the WB catalogs that we have. We have not found a non-logo as yet. When we do we will post it. "117" - Regular Case Posts - Regular Dust Guard - "PUSH SHACKLE IN TO GET KEY OUT". 2 1/2" wide. (actual: 2.504" wide x 3.195" high x .735" deep). Bronze case. Bronze shackle. Post key. Key retaining. Spring dust guard. Clevis and chain. Catalog #: 117, first appears in catalog of 1922. Mfg by: Wilson Bohannan Co. 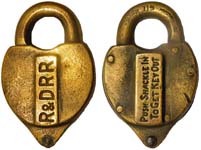 This lock is not listed in any of the WB catalogs that we have. "300" - "WB". 2" wide. (actual: 2.120" wide x 2.674" high x .512" deep). Bronze case. Bronze shackle. Post key. Catalog #: 300, first appears in catalog of 1894. "W BOHANNAN BROOKLYN N.Y. PAT. 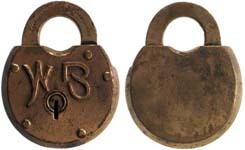 JUNE 25 79" is stamped on the obverse of the shackle. Mfg by: Wilson Bohannan Co. Wilson Bohannan Patent # 205171. 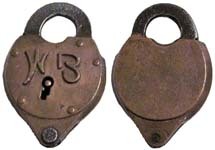 "300A" - "WB" - Bronze Shackle. 2" wide. (actual: 2.109" wide x 2.676" high x .554" deep). Bronze case. Bronze shackle. Post key. Clevis and chain. Catalog #: 300A, first appears in catalog of 1911. 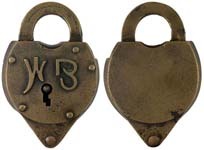 Mfg by: Wilson Bohannan Co.
"300A" - "WB" - Iron shackle. 2" wide. (actual: 2.118" wide x 2.702" high x .575" deep). Bronze case. Iron shackle. Post key. 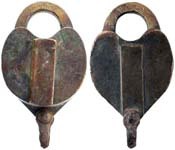 Double tab clevis and chain. Catalog #: 300A, first appears in catalog of 1911, variation not listed. Mfg by: Wilson Bohannan Co.
"300" - No "WB" - Double Keyway. 2" wide (Actual: 2.125” wide x 2.684” high x .510” deep). Bronze case. Bronze shackle. Post key. Catalog #: 300, first appears in catalog of 1894, variation not listed. Mfg by: Wilson Bohannan Co. Wilson Bohannan Patent # 205171. 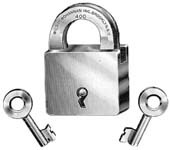 When we find a Non-Logo #300 double keyway lock we will post it. "301" - "WB". 2" wide (Actual: 2.136" wide x 2.680” high x .514” deep). Bronze case. Bronze shackle. Flat key. Catalog #: 301, first appears in catalog of 1900. Mfg by: Wilson Bohannan Co.
"305" - "WB". 1 1/2" wide. (actual: 1.568" wide x 1.992" high x .440" deep). Bronze case. Bronze shackle. Post key. Catalog #: 305, first appears in catalog of 1922. Mfg by: Wilson Bohannan Co. Wilson Bohannan Patent # 205171. "306" - "WB". 1 1/2" wide. (actual: 1.580" wide x 1.989" high x .422" deep). Bronze case. Bronze shackle. Post key. Clevis and chain. Catalog #: 306, first appears in catalog of 1922. Mfg by: Wilson Bohannan Co.
"311" - "WB". 2 1/4" wide. (actual: 2.294" wide x 2.904" high x .618" deep). Bronze case. Bronze shackle. Post key. 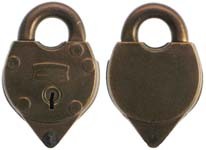 Double tab clevis and chain. Catalog #: 311, first appears in catalog of 1900. Mfg by: Wilson Bohannan Co.
"450" - "WB". 1 3/4" wide. (actual: 1.850" wide x 2.400" high x .534" deep). Bronze case. Bronze shackle. Flat key. Catalog #: 450, first appears in catalog of 1894. Mfg by: Wilson Bohannan Co.
"500". 1 3/4" wide. (actual: 1.758" wide x 2.512" high x .542" deep). Bronze case. Bronze shackle. Flat key. Catalog #: 500, first appears in catalog of 1894. Mfg by: Wilson Bohannan Co.
"503" - Plaque - "W. BOHANNAN PAT.MAY 26.85 BROOKLYN-N.Y". 1 1/4" wide (Actual: 1.303" wide x 1.686” high x .360” deep). Bronze case. Bronze shackle. Post key. Catalog #: 503, first appears in catalog of 1886. Mfg by: Wilson Bohannan Co. Wilson Bohannan Patent # 318537. 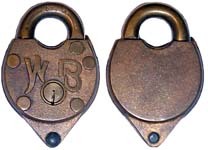 "503" - "WB" - Round Shackle. 1 1/4" wide. (actual: 1.315" wide x 1.666" high x .373" deep). Bronze case. Bronze shackle. Post key. Catalog #: 503, first appears in catalog of 1886. Mfg by: Wilson Bohannan Co.
"503" - "WB" - Flat Shackle. 1 1/4" wide. (actual: 1.292" wide x 1.722" high x .340" deep). Bronze case. Bronze shackle. Post key. Catalog #: 503, first appears in catalog of 1886. Mfg by: Wilson Bohannan Co.
"504" - Plaque - "W. BOHANNAN PAT.MAY 26.85 BROOKLYN-N.Y". 1 1/4" wide. (actual: 1.314" wide x 1.672" high x .354" deep). Bronze case. Bronze shackle. Post key. 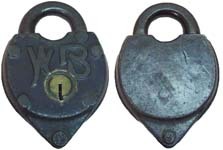 Double tab clevis and chain. Catalog #: 504, first appears in catalog of 1886. Mfg by: Wilson Bohannan Co. Wilson Bohannan Patent # 318537. 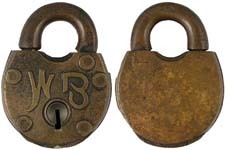 "504" - "WB" - Round Shackle. 1 1/4" wide (Actual: 1.330” wide x 1.934” high x .368” deep). Bronze case. Bronze shackle. Post key. 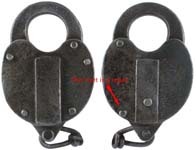 Double tab clevis and chain. Catalog #: 504, first appears in catalog of 1886. Mfg by: Wilson Bohannan Co.
"504" - "WB" - Flat Shackle. 1 1/4" wide. (actual: 1.280" wide x 1.724" high x .346" deep). Bronze case. Bronze shackle. 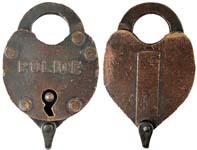 Post key. 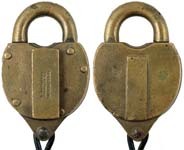 Double tab clevis and chain. Catalog #: 504, first appears in catalog of 1886. Mfg by: Wilson Bohannan Co.
"509". 1 3/4" wide. (actual: 1.852" wide x 2.419" high x .528" deep). Bronze case. 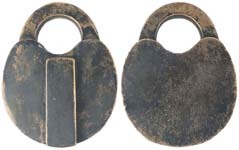 Bronze shackle. Post key. Catalog #: 509, first appears in catalog of 1886. Mfg by: Wilson Bohannan Co. Wilson Bohannan Patent # 318537. "510". 1 3/4" wide. (actual: 1.832" wide x 2.418" high x .543" deep). Bronze case. Bronze shackle. Post key. Clevis and chain. Catalog #: 510, first appears in catalog of 1886. Mfg by: Wilson Bohannan Co.
"511". 2" wide. Bronze case. Bronze shackle. Post key. Spring dust guard. Catalog #: 511, first appears in catalog of 1886. "W. BOHANNAN BROOKLYN-N.Y.PATD MAY 26.85" is stamped on the dust guard. Mfg by: Wilson Bohannan Co. Wilson Bohannan Patent # 318537. "512". 2" wide. (actual: 2.168" wide x 2.732" high x .586" deep). Bronze case. Bronze shackle. Post key. Spring dust guard. 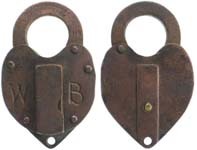 Double tab clevis and chain. Catalog #: 512, first appears in catalog of 1886. Mfg by: Wilson Bohannan Co.
"513". 2 1/4" wide (Actual: 2.328” wide x 2.968” high x .840” deep). Bronze case. Bronze shackle. Post key. Spring dust guard. Catalog #: 513, first appears in catalog of 1886. Mfg by: Wilson Bohannan Co.
"514". 2 1/4" wide. (actual: 2.343" wide x 2.918" high x .654" deep). Bronze case. Bronze shackle. Post key. Spring dust guard. 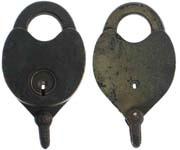 Double tab clevis and chain. "W. BOHANNAN BROOKLYN N.Y." is stamped on the dust guard. Catalog #: 514, first appears in catalog of 1886. Mfg by: Wilson Bohannan Co.
"519" - Plaque - "W. BOHANNAN BROOKLYN N.Y.". 1 1/2" wide. (actual: 1.606" wide x 2.090" high x .463" deep). Bronze case. Bronze shackle. Flat key. Catalog #: 519, first appears in catalog of 1886. Mfg by: Wilson Bohannan Co.
"519" - "WB". 1 1/2" wide. (actual: 1.622" wide x 2.064" high x .470" deep). Bronze case. Bronze shackle. Flat key. Catalog #: 519, first appears in catalog of 1886. Mfg by: Wilson Bohannan Co.
"520" - "WB". 1 1/2" wide. (actual: 1.612" wide x 2.074" high x .472" deep). Bronze case. Bronze shackle. Flat key. 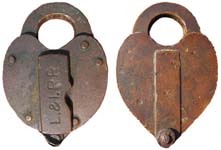 Double tab clevis and chain. Catalog #: 520, first appears in catalog of 1886. Mfg by: Wilson Bohannan Co.
"521" - Plaque - "W. BOHANNAN BROOKLYN N.Y.". 1 3/4" wide. Bronze case. Bronze shackle. Flat key. Catalog #: 521, first appears in catalog of 1886. Mfg by: Wilson Bohannan Co.
"521" - "WB". 1 3/4" wide (Actual: 1.865” wide x 2.462” high x .623” deep). Bronze case. Bronze shackle. Flat key. Catalog #: 521, first appears in catalog of 1886. Mfg by: Wilson Bohannan Co.
"522" - "WB". 1 3/4" wide (Actual: 1.852” wide x 2.910” high x .610” deep). Bronze case. Bronze shackle. Flat key. 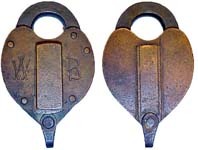 Double tab clevis and chain. Catalog #: 522, first appears in catalog of 1886. Mfg by: Wilson Bohannan Co.
"523" - Plaque - "W. BOHANNAN BROOKLYN N.Y." 2" wide. (actual: 2.151" wide x 2.728" high x .636" deep). Bronze case. Bronze shackle. Flat key. Catalog #: 523, first appears in catalog of 1890, variation not listed. Mfg by: Wilson Bohannan Co.
"523" - "WB". 2" wide. (actual: 2.137" wide x 2.795" high x .620" deep). Bronze case. Bronze shackle. Flat key. Catalog #: 523, first appears in catalog of 1890. Mfg by: Wilson Bohannan Co.
"524" - Plaque - "W. BOHANNAN BROOKLYN N.Y.". 2" wide (Actual: 2.122” wide x 3.148” high x .628” deep). Bronze case. Bronze shackle. Flat key. 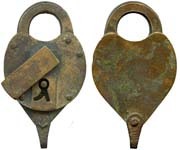 Double tab clevis and chain. Catalog #: 524, first appears in catalog of 1886. Mfg by: Wilson Bohannan Co.
"524" - "WB". 2" wide. Bronze case. Bronze shackle. Flat key. New improved Double tab clevis and chain. Catalog #: 524, first appears in catalog of 1886. Mfg by: Wilson Bohannan Co.
"525" - Plaque - "W. BOHANNAN BROOKLYN N.Y.". 2 1/4" wide. (actual: 2.258" wide x 2.985" high x .620" deep). Bronze case. 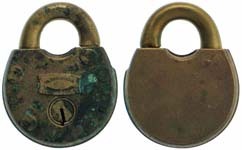 Bronze shackle. Flat key. Catalog #: 525, first appears in catalog of 1886. Mfg by: Wilson Bohannan Co.
"525" - "WB". 2 1/4" wide (Actual: 2.325” wide x 2.958” high x .670” deep). Bronze case. Bronze shackle. Flat key. Catalog #: 525, first appears in catalog of 1886. Mfg by: Wilson Bohannan Co.
"526" - Plaque - "W. BOHANNAN BROOKLYN N.Y.". 2 1/4" wide. (actual: 2.272" wide x 2.966" high x .606" deep). Bronze case. Bronze shackle. Flat key. 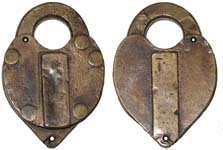 Double tab clevis and chain. Catalog #: 526, first appears in catalog of 1886. Mfg by: Wilson Bohannan Co.
"526" - "WB". 2 1/4" wide. (actual: 2.314" wide x 2.932" high x .670" deep). Bronze case. Bronze shackle. Flat key. 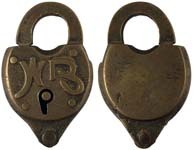 Double tab clevis and chain. Catalog #: 526, first appears in catalog of 1886. 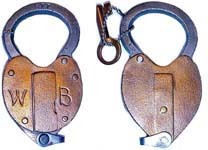 Mfg by: Wilson Bohannan Co.
"527" - "WB" - Extra Large Shackle. 2 1/4" wide. Bronze case. Bronze shackle. Flat key. Catalog #: 527, first appears in catalog of 1890. Mfg by: Wilson Bohannan Co.
"530" - Plaque - "W. BOHANNAN BROOKLYN N.Y.". 2 1/4" wide. (actual: 2.318" wide x 2.980" high x .635" deep). Iron case. Iron shackle. Flat key. Catalog #: 530, first appears in catalog of 1886. Mfg by: Wilson Bohannan Co.
"530" - "WB". 2 1/4" wide. (actual: 2.324" wide x 3.026" high x .699" deep). Iron case. Iron shackle. Black japanned finish. Flat key. 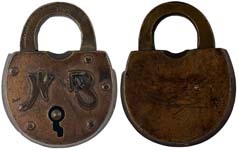 This lock was offered in the following finishes: Galvanized and Black japanned. Catalog #: 530, first appears in catalog of 1890. Mfg by: Wilson Bohannan Co.
"531" - Plaque - "W. BOHANNAN BROOKLYN N.Y.". 2 1/4" wide. (actual: 2.317" wide x 2.953" high x .650" deep). Iron case. Iron shackle. Flat key. 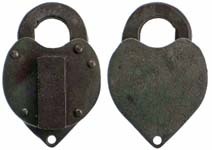 Double tab clevis and chain. Catalog #: 531, first appears in catalog of 1886. 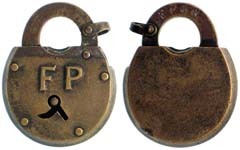 Mfg by: Wilson Bohannan Co.
"531" - "WB" - Case Style 1 - Round Shackle - BR&P. 2 1/4" wide. (actual: 2.338" wide x 2.978" high x .668" deep). Iron case. Iron shackle. Black japanned finish. Flat key. 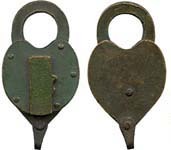 Double tab clevis and chain. 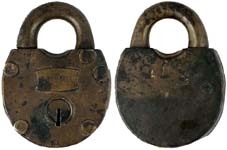 This lock was offered in the following finishes: Galvanized and Black japanned. Catalog #: 531, first appears in catalog of 1890. 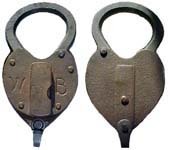 Mfg by: Wilson Bohannan Co.
"531" - "WB" - Case Style 2 - Flat Shackle. 2 1/4" wide. (actual: 2.321" wide x 2.946" high x .628" deep). Iron case. Iron shackle. Black japanned finish. Flat key. 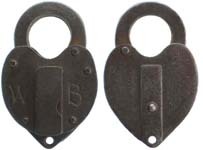 Double tab clevis and chain. 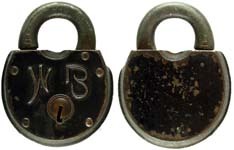 This lock was offered in the following finishes: Galvanized and Black japanned. Catalog #: 531, first appears in catalog of 1890, variation not listed. Mfg by: Wilson Bohannan Co.
"550" - "WB". 2" wide. (actual: 2.094" wide x 2.658" high x .532" deep). Bronze case. Bronze shackle. Flat key. Catalog #: 550, first appears in catalog of 1894. Mfg by: Wilson Bohannan Co.
"676". 2" wide. (actual: 2.048" wide x 2.737" high x .584" deep). Iron case. Iron shackle. Galvanized finish. Post key. Spring dust guard. Catalog #: 676, first appears in catalog of 1922. Mfg by: Wilson Bohannan Co.
"680" - "WB". 2 1/4" wide (Actual: 2.280” wide x 3.040” high x .719” deep). Iron case. Iron shackle. Galvanized finish. Spring dust guard. Catalog #: 680, first appears in catalog of 1922. Mfg by: Wilson Bohannan Co. 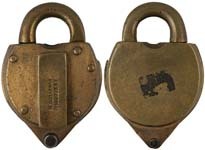 This lock is not marked 680 but meets the characteristics of the 1922 and 1930 catalogs. 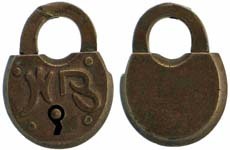 "681" - "WB" - Bronze Shackle. 2 1/4" wide (Actual: 2.289” wide x 2.972” high x .706” deep). Iron case. Bronze shackle. Clevis and chain. No spring on dust guard. Catalog #: 681, first appears in catalog of 1922. Mfg by: Wilson Bohannan Co. 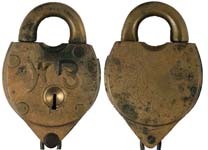 This lock is not marked 681 but meets the characteristics of the 1922 and 1930 catalogs. 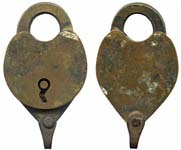 "681" - "WB" - Iron Shackle. 2 1/4" wide (Actual: 2.310” wide x 3.055” high x .680” deep). Iron case. Iron shackle. Clevis and chain. Spring dust guard. Catalog #: 681, first appears in catalog of 1922. Mfg by: Wilson Bohannan Co.
"681" - No "WB". 2 1/4" wide (Actual: 2.286” wide x 3.428” high x .842” deep). Iron case. Iron shackle. Clevis and chain. Spring dust guard. Catalog #: 681, first appears in catalog of 1922. Mfg by: Wilson Bohannan Co.
"860" - "WB" - Bull Ring Shackle. 2 1/2" wide (Actual: 4.788" high x 2.570" wide). Brass case. 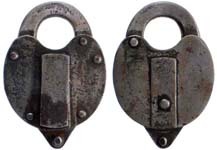 Steel bull ring shackle. This lock is keyed the same as #2801. 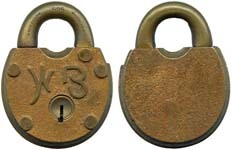 It is possible that the number on the shackle is not a catalog number, but rather a sequential number ordered by a customer. Catalog #: 860. 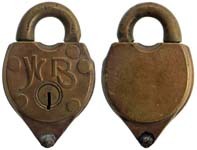 This lock is not listed in any WB catalogs that we have. Mfg by: Wilson Bohannan Co.
"877" - "WB" - Bull Ring Shackle. 2 1/2" wide (Actual: 4.788" high x 2.545" wide). Brass case. 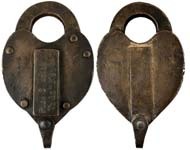 Steel bull ring shackle. 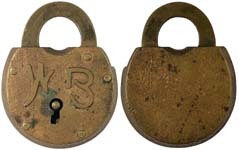 This lock is keyed the same as #3126. 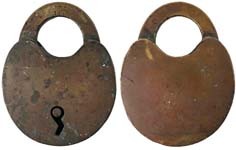 It is possible that the number on the shackle is not a catalog number, but rather a sequential number ordered by a customer. Catalog #: 877. 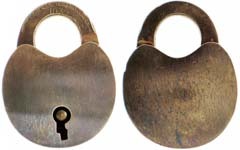 This lock is not listed in any WB catalogs that we have. Mfg by: Wilson Bohannan Co.